I've had many meetings with heads of nations all around this world. And in these meetings, I discuss with them their problems and especially the world problems of peace, international problems and of the world in general. You know, we live in a world that is an unbelievable paradox. We're in a world of awesome progress; awesome accomplishment in this twentieth century especially, and yet a world of appalling evils. And I think that never before in world history has the world been in so much trouble and has been plagued with so many evils as it is right now. Almost nobody is contented or happy today; everybody is out to get all we can get. People are interested only in the physical things that don't make them happy and that don't bring contentment, and they don't know why they're unhappy, they don't know what is wrong. Half of the world is illiterate; half of the world is living in abject poverty, filth and squalor, and yet some of the world is living too rich, with so much that it makes them unhappy. It's a terrible paradox. Now world leaders are saying — and world famous scientists have said that they feel the only hope of any solution of our problems in this world would be a great one world government; to rule and govern over the whole world. Only one military force and in such a government even that would not be necessary. But in the same breath they say it's impossible for man to ever get together and organize such a government. Such a thing, they say, would be absolutely impossible. Now, that is the subject that I do talk to them about and that I want to talk to you and that I have for the whole world is the subject of ... What about the world tomorrow? Why do we have that as the actual title and the name of this program — 'The World Tomorrow?' I have good news for you because there is good news coming. There is a better world coming. But the world doesn't understand it and doesn't know how it will come and why. 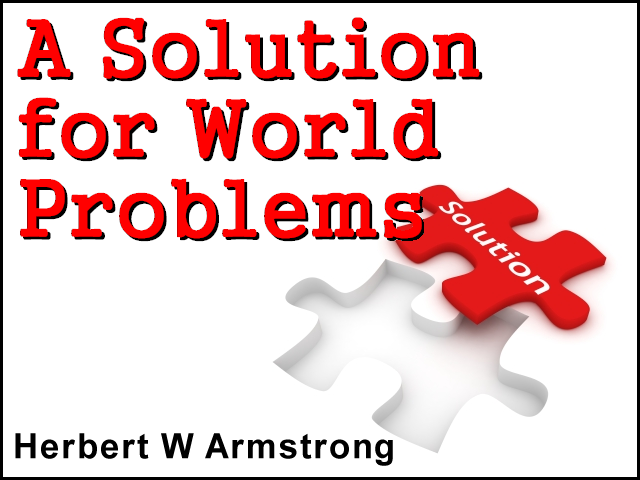 Now a noted religious evangelist said one time that the solution to all problems, personal or international or world troubles or otherwise is, Jesus Christ: Jesus Christ is the solution. Well now, was he right? If what he meant — and I think he meant — was merely people saying: "I accept Christ as my personal Savior;" the answer is no, he was not right, that will not solve this world's problems. Millions are confessing that they accept Christ, they receive ... the whole world is out to get not to give, to appropriate, to take, to receive; but just receiving Christ alone is not enough. But I wonder, have you heard about Christ? When they preach about Christ and they preach how wonderful it is to know Christ, have you heard them say that Christ was born to be a King? That Christ is coming as a Ruler to rule by power and by force and to bring us peace, and to force this world to be happy, even when it wants to do the way and live the way that is making it so unhappy? You've heard very little about that. You don't hear that proclaimed very often, you merely hear about Jesus as a Savior and if you just confess Christ, if you just receive, you get, you appropriate Christ, you'll go to heaven when you die. My friends, it's a great deal more than that and many are being duped and misled on a false Christianity and a false religion. "The beginning of the gospel of Jesus Christ, the Son of God [and then coming to verse fourteen]: Now after that John was put in prison, Jesus came into Galilee preaching the gospel of the kingdom of God [preaching what gospel? The gospel of the kingdom of God, and the kingdom of God is a government. He was born to be a king "...the government shall be on his shoulder" (Isaiah 9:6). The kingdom of God is a government]. And saying, the time is fulfilled, and the kingdom of God is at hand: repent ye [you don't hear much preaching about repentance my friends; just accept Christ, that's all you have to do, so they tell you and so they mislead you], repent ye and believe the gospel." (Mark 1:1, 14-15). Now that is the message of Jesus Christ. After the crucifixion and the resurrection of Christ, as is known in history, Jesus Christ ascended to heaven to the right hand of God the Father at the throne of the whole universe, of God in heaven, and He's been there as the High Priest over His Church these last 1950 years. But, Jesus said before He left — as you read in John fourteen, John 14:2-3. Now the other scriptures in prophecy say that when He comes again He is coming with clouds; and He is coming precisely as He went. And He will descend from the clouds right down on the Mount of Olives, where He will descend; and you read of that in the fourteenth chapter of the book of Zechariah, which is just next to the end of the Old Testament in your Bible (Zechariah 14:4). Now, I wonder how many believe that Jesus is only coming just invisibly and mystically in men's hearts. That doesn't mean any real coming — you see, the angels said He will come as you have seen Him go, He will come as you have seen Him go. He is coming literally. And now looking to Revelation, I want you to notice Revelation 1:7: "Behold, he cometh with clouds [that's the way He went and that's the way He's going to come, with clouds): and every eye shall see him [all over the world, every eye shall see Him] and they also which pierced him [they will be resurrected and see Him in the resurrection]: and all kindreds of the earth shall wail because of him. Even so, Amen (Revelation 1:7). As you read in the seventh verse of Revelation the first chapter. And because their deeds were evil they didn't love the light that would tell them the cause of all of the wrong effects that we're having. They wanted to go on causing the troubles and then hope that they wouldn't have the troubles. And that is the way mankind has ever been from the foundation of the world; ever since the first humans, Adam and Eve, it has been like that. Now, what does that mean? You know, I read about a man, matter of fact it was supposed to have been a Methodist bishop — many, many years ago — who came to a church and was trying to preach a sermon on repentance and the congregation didn't understand what he meant, he couldn't seem make it clear so they could understand. And there was a colored man in the back who had not had much education and he rose and raised a hand and asked: "Please sir, I wonder if I could just say a word, I think I could explain": and the Methodist bishop said: "Why yes sir, of course you may." So, he said — well — he started to walk rapidly from the rear right down the aisle to the front, and he says: "I'm going to hell, I'm going to hell, I'm going to hell, I'm going to hell." And when he got down to the end of the aisle he turned around and he said: "I'm going to heaven, I'm going to heaven, I'm going to heaven, I'm going to heaven." He said: " I think what you all mean sir is turn around and go the other way." Change your mind, think different thoughts, live differently than you've been living, change your lifestyle, repent, repent of what you are, repent of what you have done. I mentioned before how many years ago, it was up in Springfield, Oregon; oh, this must have been about — at least forty years ago. I was in Springfield, Oregon one time and there was a Los Angeles evangelist up there. He had a tent, he was holding tent meetings and he had about, oh four or five young men of college age, and very well dressed and very attractive looking young men, going around, each man carrying a Bible and accosting everybody and inviting them to come to the meetings. And one of them accosted me and I said: "Well, if I come, will your minister tell me that I would have to repent of my sins and be saved from my sins?" He said, "Oh yes sir". "Well, can he tell me what sin is?" "Oh yes, yes." I said, "What is sin, can you tell me, can you give me a Bible definition; just like a dictionary —'sin is:' and then give me the definition?" "Well," he said, "Christ died for our sins." I said; "Well yes, I know that, but what is the definition, what did He die for, what is sin?" "Well", he said, "Christ died for our sins." And I said, "Well, I know that, but I want a Bible definition." And pretty soon another young man came up and he couldn't answer — and then a third and a crowd was gathering around and pretty soon there was quite a little crowd there and one of them brought the minister, the evangelist himself. I said, "I think you know the Bible definition of sin — will you tell us?" He was angry and turned and said, "Come on fellows, get away from this guy." "...sin is the transgression of the law" (I John 3:4). And then you will read where Paul said: "...the law is spiritual" (Romans 7:14), and ...the law is holy just and good" (Romans 7:12). But they're trying to tell you that God's law, which is God's way of life — it defines God's way of life — is done away. That is the trouble with modern Christianity my friends, it's about time we wake up to understand it and to realize it. Now that's not very popular but it happens to be the truth, and it's about time some of us begin to understand the truth. The greatest shock that I ever had in my life was back in between the fall of 1926 and the spring of 1927, when I saw in my Bible just the opposite of what I'd been taught in Church. Why have people been so misled? WHY has not the true Gospel of Jesus Christ been preached to people? I ask you WHY? This voice cries out and asks WHY? Open your Bible and believe what God says; I don't say believe me. I could be just as wrong as anybody else. Don't believe me, don't believe the minister, don't believe the evangelist, believe what God says, the Word of God; because the Bible is the Word of God. Now if you haven't proved that, maybe you ought to write in for proof and we'll send you something. All human evils have come from the violation of the law of God. The law of God is God's way of life, it's the way God lives, it's the way Jesus Christ has always lived; it's the way Jesus Christ did live when He was here on this earth. And that is the way of love, and that is the way of God's law, and the law of God is love. Now, we magnify that law, and as we magnify it out a little bit it is love to God Almighty first, love to the Creator who is Himself love and who loved us so much that "...he gave his only begotten Son, that whosoever believeth in him should not perish" (John 3:16), not go to hell and burn forever and ever, but perish; but have what? Everlasting life which you don't have now whether you think you do or not, God's word says you don't. But you can have it, you can have it, God offers it to us freely. And so, "...sin is the transgression of God's spiritual law" (I John 3:4 paraphrased), and that law is love, and it's love to God and love to your neighbor. It's a spiritual law and I simply simplify it by the simple word "give" and the opposite is "get" and the world is living the way of get. That is the way of vanity, and the way of coveting, of greed, of wanting to get, wanting to possess, the way of animosity, of jealousy and envy against others, of competition and strife, of resentment against authority over one, and of ignoring God — having no love for God whatsoever; just wanting to keep God right out of your life altogether. Isn't that the way most of you have been my friends? You don't like to hear about God, you don't want to know the things of God. No wonder this world is so unhappy. Until we know God's way of life, the way God Himself lives, the way He and Christ have always lived when it was just God and the Word; before even an angel was created, before any humans were created, before matter was even created over the whole universe. They lived together in happiness, in peace and in cooperation, and in love, and that's the only way that we can ever have peace on this earth. And God is going to have to send Jesus Christ, and send Him not as He came as the man from Nazareth before, and incidentally, He did not have long hair because you will read in the New Testament in your Bible that "...even nature ought to teach you that it is a shame for a man to have long hair" (I Corinthians 11:14 paraphrased), yet that seems to be the style today, has been for about the last ten years now. For a man to have long hair; if God says you shouldn't do it, well people want to do it, they want to do just the opposite. Why are we like that? Why do we bring and inflict so much punishment and so much unhappiness on ourselves because that's what we've been doing and that's all we've been doing all these many, many years? God is going to have to send Jesus Christ in power, in all the power and the glory of the Everlasting God to compel this world to be happy. To rule the world and to set up a one world Government; to do away with politics altogether and to do away with this world's religions. This world's Christianity has tried to do away with the law of God and God's Way of life and God's way of life is the only way that can bring us happiness. And living contrary to that Way is sin; and that kind of sin is what has brought on all the unhappiness and all of the woes that we have in this world today. Oh, I could plead, I could shout, I could yell, what good does it do my friends; people don't want to listen. "...this is the condemnation, that light is come into the world, and men loved darkness rather than the light" (John 3:19). Honestly, do you? I hope not, I sincerely hope not. Let's get our eyes open and let's come to a little bit of the truth. Calling her — calling our people, out of that kind of Babylon. And that is what I am trying to do. I want to call people out of this world's Babylon, this confusion of religion and get to the pure Word of God and what He says; read your Bible, look into the Bible, don't believe me, don't believe ministers, don't believe the man; because this world has been misled. But believe what God says. And that's what I've been trying to do and show the people their sins. But will you heed? "Except ye repent, ye shall all likewise perish" (Luke 13:3 paraphrased). So said Jesus Christ. This program is called "The World Tomorrow." The gospel is the good news of the world tomorrow. The good news or the gospel of the kingdom of God and the kingdom of God is going to rule the world tomorrow: a one world government. Now what will that government be like? I have a booklet that you need; it's different than anything you've ever read in your life: 'The Wonderful World Tomorrow - What It Will Be Like', 'The Wonderful World Tomorrow - What It Will Be Like.' You've never read anything like it; it is a booklet of ninety-six pages — almost a hundred pages — it's well illustrated. I want to just give you a few little subheads to give you an idea of what is in it. There will be both Church and State in the world tomorrow. There won't be a lot of different religions — there'll be only one religion and that'll be God's religion with Jesus Christ at the Head Himself. Now this will tell you how the government will be organized on the international level. The re-education of the world; so much of today's education has been mis-education. And it's ten times as hard to unlearn error as it is to learn new truth that you never knew. It's going to take a little time but that's going to have to be done. And then, so many things — on just what form, what government structure will it be, who will be ruling? Who will be ruling under Christ? Who will be in this type of position and that type of position? There is so much; you need this booklet: 'The Wonderful World Tomorrow - What It Will Be Like', 'The World Tomorrow.' Just write for that booklet, there's no cost, no charge and there's not going to be any follow up requesting money, that's one thing we don't do on this program. God's way is give not get, we give, we don't beg, we don't get. I don't have time to go into it now, I see I am out of time, We're not out to get but to give, there is no program like this, it is utterly unique in the world. No operation like this. So, until next time, this is Herbert W Armstrong, goodbye friends.